The President says he wants to work with foreigners to implement projects in Russia’s Arctic economic program. Never before has such high ranking group of officials visited Russia’s archipelago of Franz Josef Land. Together with the President on Wednesday was Prime Minister Dmitry Medvedev, Defense Minister Sergey Shoigu, Minister of Natural Resources and Ecology Sergey Donskoy and the president’s special envoy on nature protection, environment and transport, Sergey Ivanov. Talking about the comprehensive development of the Arctic, Vladimir Putin particularly instructed the Government «to speed up the implementation of the regional socio-economic development program,» Kremlin reports. Russia has huge plans for its Arctic regions, including boosting infrastructure along the Northern Sea Route, developing oil- and natural gas fields on the Yamal Peninsula, placing a floating nuclear power plant in Pevek and opening Arctic nature reserves for foreign tourist expedition vessels. 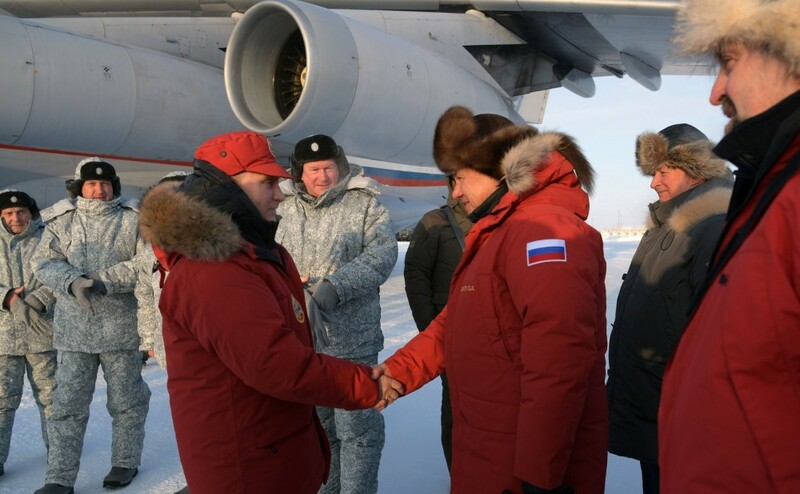 Flying from Franz Josef Land, the Russian President and Defense Minister landed in Arkhangelsk late Wednesday evening. Putin will here give a speech at the international Arctic Forum - Territory of Dialogue conference taking place this week. The conference, which has 800 foreign participants, is attended by the presidents of Finland and Iceland, foreign ministers from Russia, Iceland, Denmark and Norway, and the vice-prime ministers from Russia and China. «We are willing to work together with our foreign partners in many fields of Arctic development,» Putin said. Norway’s Foreign Minister Børge Brende, visiting Russia for the first time in three years, said in his speech at the opening of the conference that Norway eyes huge potentials for economic developments in the high north. «Norway today has a higher economic growth north of the Arctic Circle than below. Also the unemployment rate is lower in the north,» Brende said. For Putin, the Arctic shelf exploration, Northern Sea Route and infrastructure projects are important. The president in particular asked to included new approaches to develop state-private partnership in the implementation of large-scale infrastructure projects. In Arkhangelsk, the delegation of China’s Vice-Prime minister Wang Yang has already highlighted two projects ready to be invested into; the new deepwater port by the White Sea and the Belkomur railway, linking the port with the Komi Republic and the Urals. When meeting Putin on Tursday, Finland’s President, Sauli Niinistö is expected to discuss a Finnish initiative to link Europe and Asia with a new Arctic fiber cable. From Northern Finland, via Norway’s Barents Sea port of Kirkenes, along the entire Northern Sea Route to countries in Eastern Asia. Such fiber-optic cable could be bi-linked to different Russian Arctic cities and projects on the shelf or in Siberia. Except from a few military vehicles in the background in some of the photos, the press-services of both the President and the Prime Minister said nothing about the delegations’ talk on, or visit to, the newly reestablished military base on Aleksandra Land on Franz Josef Land. The President, however, underscored the importance of the Defense Ministry and the Federal Security Service (FSB) to protect Russia’s national interests in the Arctic.